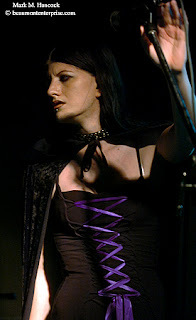 Vocalist Ravenica Rose of Port Arthur-based Freak13 sings at The Vortex in Beaumont on Friday, June 29, 2007. Freak13 and Chicago-based First Jason kicked off their national "Creatures of Crystal Lake Tour." 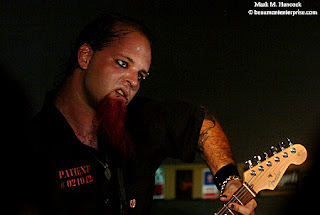 Scot Lackey of Port Arthur-based Freak13 plays guitar at The Vortex. 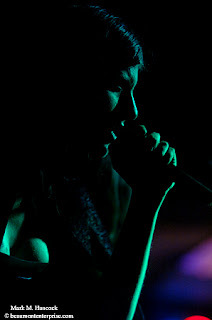 Vocalist Ravenica Rose of Port Arthur-based Freak13 performs at The Vortex. The horror convention veterans continue to New Orleans, Indianapolis and St. Louis, among nine total gigs. Chicago is the last stop on Friday, July 13. 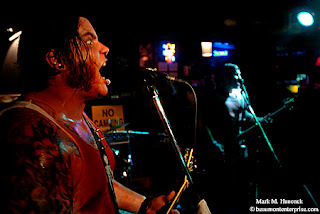 Ben "Trashbin" Lambert (left) and "Guilty" Garcia (right) of the Houston-based band Rejected Unwanted performs during a horror rock concert at The Vortex. 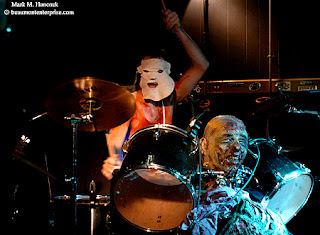 "Tucker" of the Houston-based band Rejected Unwanted plays drums during a horror rock concert at The Vortex. They performed a "love song." The song is about a woman the singer loves so much that he kills her, eats her and wears her face as a mask. Please see the entire 51-frame slideshow (without sound - listen on Freak13's MySpace page). Please also read "Rockin' Horror Picture Show" by Pete Szatmary. 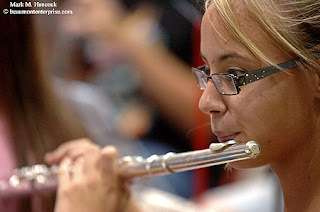 Macy Morehead, 12, of Anahuac plays flute during the annual Band Camp at Lamar University in Beaumont on Tuesday, June 26, 2007. 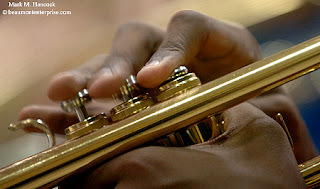 Kaaman Grant, 12, of Beaumont plays trumpet during the annual Band Camp at Lamar University in Beaumont. More than 350 students participated in the camp. 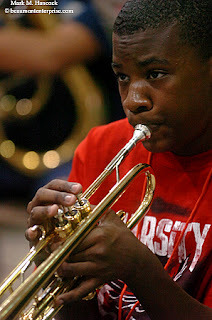 Kaaman Grant, 12, of Beaumont plays trumpet during the annual Band Camp at Lamar University. 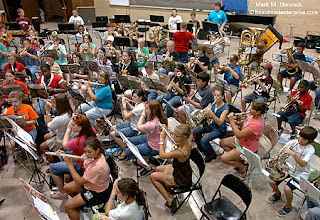 Campers practice for a performance during the annual Band Camp at Lamar University. 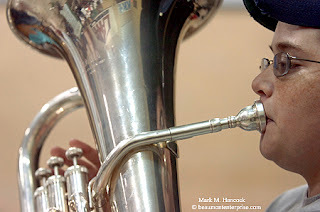 Sean Neil, 12, of Bridge City plays euphonium during the annual Band Camp at Lamar University. Ron Brooks of Beaumont participates in the 1st annual Walk Against Domestic Violence at the Crockett Street Entertainment District in Beaumont on Saturday, June 23, 2007. The event was sponsored by Family Services of Southeast Texas to raise awareness of domestic violence. 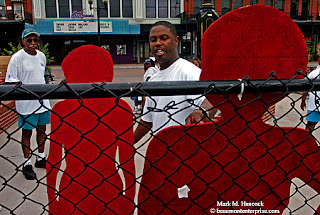 Quincy A. Jones of Beaumont (center) explains the purpose of Silent Witness silhouettes during the 1st annual Walk Against Domestic Violence at the Crockett Street Entertainment District. Last year, seven local women died at the hands of their husband or boyfriend. 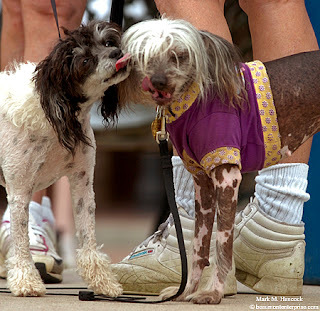 Gizelle, 1, a Chinese Crested Powderpuff, (left) gives a kiss to Halo, 10, a Chinese Crested Hairless, (right) before the 1st annual Walk Against Domestic Violence at the Crockett Street Entertainment District in Beaumont. 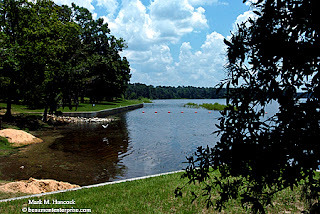 The boat launch on the eastern side of Steinhagen Lake remains unusable on Thursday, June 21, 2007. Steinhagen Lake near Jasper was refilled with water after it was drained to kill invasive plant species. A public boat ramp on the western side of Steinhagen Lake remains clogged with growth after the lake was refilled. A truck passes on a repaired U.S. Highway 190 bridge while canoes await rental by campers in Martin Dies Jr. State Park. The Texas Department of Transportation made repairs to U.S. Highway 190 bridges over the lake while it was drained. A cattle egret flies over the swimming area of Martin Dies Jr. State Park. Much of the lake is about seven feet deep while it is 35 feet in the deepest part of the Neches River channel. 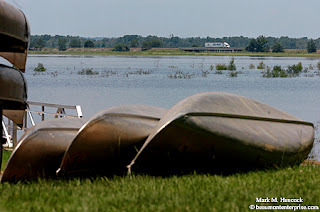 The swimming and picnic areas of Martin Dies Jr. State Park remains unused. The Hen House Ridge Camping Unit is open for visitors. The Walnut Ridge Unit is still under repair from Hurricane Rita. Water begins to kill plants that grew on the lake bed while Steinhagen Lake was dry. 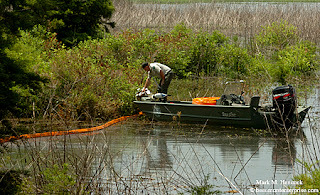 Ray Linderman (in water) and David Weeks (in boat) secure a separation boom near an outgrowth of Giant Salvinia (Salvinia molesta) on Steinhagen Lake on Thursday, June 21, 2007. 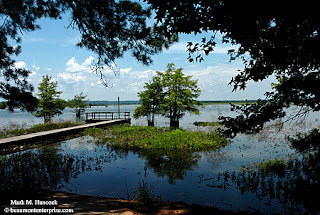 The Cherokee Unit boat launch of Martin Dies Jr. State Park has been closed until the Giant Salvinia is removed. Howard Elder, an aquatic habitat biologist with Texas Parks and Wildlife, talks about the dangers of allowing Giant Salvinia to grow. Giant Salvinia doubles its mass each seven days and kills all other water life. 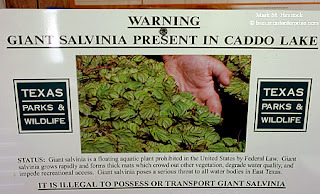 A sign in Howard Elder's office warns of transporting Giant Salvinia in Texas. It is a federal crime to possess the South American native plant. The plant is a significant problem on other Texas lakes. 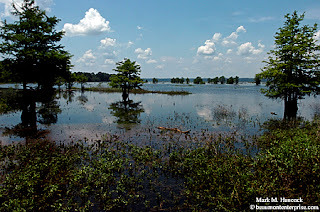 An outgrowth of Giant Salvinia (Salvinia molesta) is contained on Steinhagen Lake on Thursday, June 21, 2007. 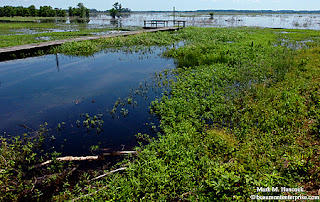 The Cherokee Unit boat launch of Martin Dies Jr. State Park has been closed until the Giant Salvinia is removed. I'll try to continue "Movie Mondays" and post a video each Monday until I get this VJ stuff figured out. Google uses .mp4 compression (5M vs. 129M files). The sound is good (use headphones), but the video doesn't compare. It's better than .avi, but it's nowhere near the original .mov. Soon enough, we'll be able to upload the full files in a matter of minutes, but this is where technology is today. This video of the Smith Oaks Bird Sanctuary includes images from earlier this spring. It's 2:12 long. Enjoy. Ella Lemonis, 3, carries her play mobile phone at her grandmother's home in Beaumont on Friday, June 22, 2007. 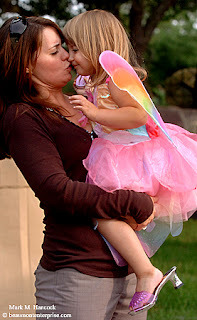 Ella prefers to dress like a fairy each time she visits her grandmother while her mother works. Jennifer Schroeder gives her daughter Ella Lemonis, 3, an after-work kiss at her mother's home in Beaumont. 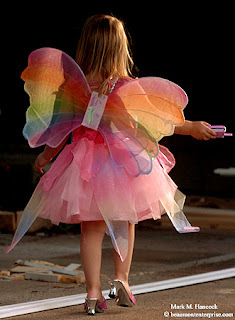 Ella has preferred to dress like a fairy ever since she was a flower girl in a wedding. Fayrouz actually found the Fairy of Beaumont. Because of our work schedules, we don't see much of each other lately. So, Fay decided to ride along with me as I hunted for features. I noticed the girl and her grandmother, but they didn't look like they were doing anything. As we drove past, Fay matter-of-factly said, "The little girl has wings." So, I turned Storm around to A) make sure my wife hadn't "lost it" and B) shoot a little girl with wings. Sure enough, she had wings. In PJ circles, there's a perpetual discussion about whether we "make" or "take" images. I acknowledge this debate and must suspend it for this post. Today, we must apply the "make" paradigm in order to explain this important compositional concept. When painters set a new canvas on an easel, they must make several choices before they begin work. They often decide a color pallet, subject and approach. While there are exceptions, most paintings begin with a background. The artist may paint the sky, mountains or trees. Then, they apply additional layers of information leading toward the foreground elements. It would be nearly impossible to begin with blades of grass in the foreground and fill the background between them. Photographers are presented with a new canvas each time they prepare to make an image. Like the painterly artists, it's best to build the image from the back to the front. When arriving at a location, immediately scout clean backgrounds. We look for evenly lit, typically monochromatic areas to place subjects within. The size of the background area often determines which lens to use. If we're using the open sky as a background and can get close to the subject, a wide-angle lens is a good choice. 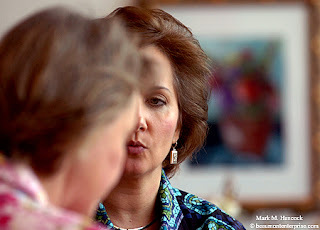 If background options are nothing but clutter or access is difficult, we'll often reach for a long (telephoto) lens. In both cases, the background combined with the foreground determines the exact lens approach to the subject. Either way, we have a clean background upon which to place the remainder of the image. Light intensity is often the predominant issue when selecting appropriate backgrounds. We tend to look for backgrounds with equal or less light than the foreground elements. Backgrounds with more than three stops difference (darker) are called "low key" backgrounds. The light intensity difference allows the subject to pop off a muted background. However, sometimes we'll opt to use a high key background to get a different feel for an image. A "high key" background is often five or more stops brighter than the main subject. When the main subject is properly exposed, most of these backgrounds appear white. As a precaution, it's best to use fill flash when shooting against most high-key backgrounds. Whether we use darker or lighter backgrounds, the important issue is to have sufficient difference in light intensity to isolate the subject. The light intensity on a background can also add to or negate the effects of color. For instance, a black wall with five times (five stops) more light than the foreground element appears muddy white. Consequently, it's important to also factor in background reflectivity to the light intensity to achieve desired results. Contrast is the difference between two subjects. In simple terms, contrast is the difference between the reflectivity of black and white. In terms of color, it's also the difference between a color and its complementary color. Surfaces with high reflectivity are often in contrast with surfaces with high light absorption. For instance, black velvet absorbs light while white ice reflects light. Although these two surfaces can be in the same (harsh) light, the contrast between the two surfaces can exceed the dynamic range. Likewise, two subjects in the same light that reflect complementary colors from a color wheel are in contrast (red/cyan, blue/yellow, green/magenta). The complementary colors of brown, red and yellow (common skin colors) typically complement the blue to cyan color groups. This is why bluish backgrounds are often chosen as backgrounds when photographing humans. The crux of this post has been to understand backgrounds are frequently the first compositional element chosen by PJs. Once a background is selected, PJs can move until the subject aligns with the background. Then, additional layers of information can be included via lens selection, angle and position. While the subject of the image remains the most important factor, the background is often the difference between a successful, professional image and an amateur snapshot. When images are designed and composed from the back to the front, they're more successful. 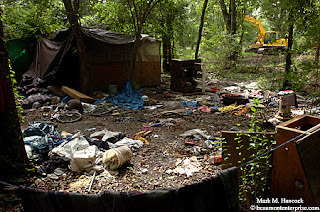 A shack remains on the wooded property by the former Dollinger steel plant where construction has started in Beaumont on Tuesday, June 19, 2007. Neighbors have complained to the city about transients living in tents and other temporary shelters around the former steel plant. 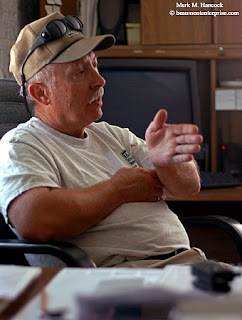 Please read "Transients near old Dollinger steel mill worry residents" by Dee Dixon. 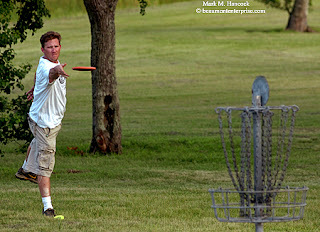 Allan Caldwell of Houston releases his disc during the weekly golf club match at the Golden Triangle Disc Golf Course at Pleasure Island in Port Arthur on Wednesday, June 20, 2007. The City of Port Arthur is considering plans to convert the course into a recreational vehicle park. 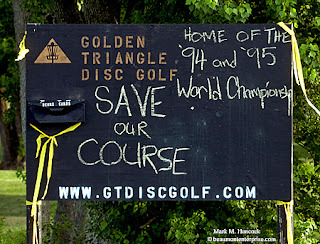 Disc golf club members have added notes in chalk to the score card station at the Golden Triangle Disc Golf Course at Pleasure Island in Port Arthur. 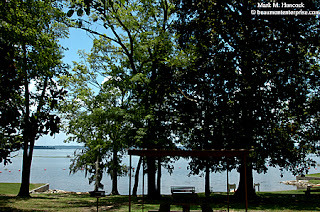 Recreational trailer owners take advantage of the view of Sabine Lake near the Golden Triangle Disc Golf Course at Pleasure Island. 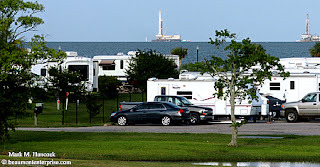 The current RV areas on the island are filled to capacity with construction workers. City officials want to accommodate temporary area workers as well as future visitors. Golden Triangle Disc Golf Club president Jeff Thompson throws his disc toward a basket at the Golden Triangle Disc Golf Course at Pleasure Island. He is against the idea of turning the 15-year-old course into an RV park. 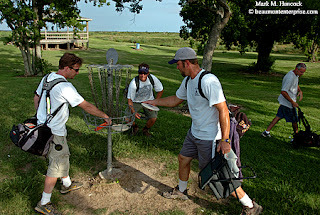 Jeff Thompson, (from left to right) Allan Caldwell, Dwight LeGrand and Brian Jones complete a basket at the Golden Triangle Disc Golf Course at Pleasure Island. 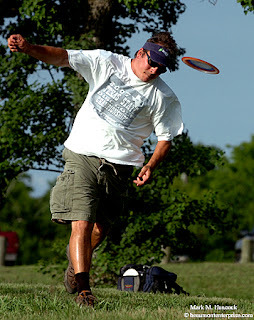 Please read "RV park moving to replace disc golf" by Christine Rappleye. 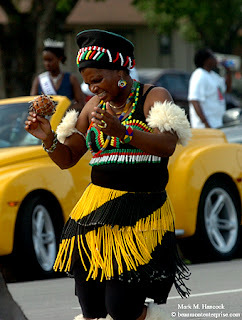 Thandi Hicks of Kuumba House dances down Proctor Street during the Juneteenth Parade in Port Arthur on Tuesday, June 19, 2007. Juneteenth celebrates the emancipation of Texas slaves in 1865. 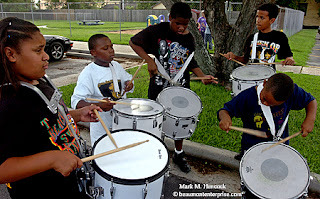 Tekoa Academy Drum Line members (from left to right) Angie Moore, 10; Lorenzo Henderson, 10; James Collins, 14; Amos Jones, 13; and Derek Moore, 7, practice before the Juneteenth Parade. Miss Juneteenth, Ozen High School senior Danyelle Vaughn, 16, finds her place atop a truck before the Juneteenth Parade in Port Arthur. 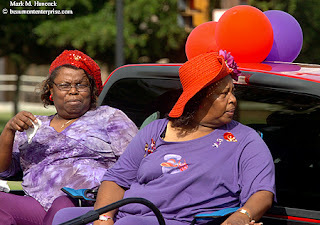 Red Hat Society members Barbara Scott (left) and Jeanette Stafford (right) watch nearby preparations before the Juneteenth Parade in Port Arthur. Believe it or not, this is every participating group in the parade. There were almost as many law enforcement officials in the parade as there were other parade participants. 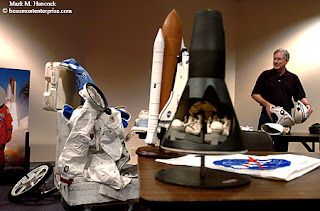 Texas Energy Museum director Ryan Smith investigates a Space Shuttle helmet as he prepares for the SpaceVentures program at the museum in Beaumont on Friday, June 15, 2007. 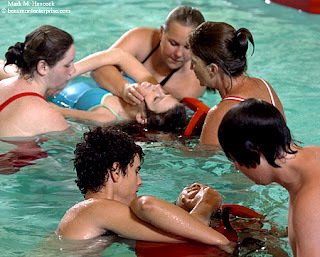 Instructor Berti Loken (clockwise from left) observes as Eddie Dyess, 8, of Vidor is placed on a backboard by Kylie Hale, 18, of Kirbyville and Jessica Dunnigan, 15, of Beaumont during a Red Cross lifeguard course at the City of Orange Natatorium in Orange on Thursday, June 14, 2007. Area pools are having difficulty locating qualified lifeguards. 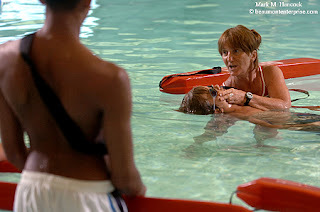 Red Cross lifeguard course instructor Berti Loken demonstrates techniques on Eddie Dyess, 8, of Vidor during the course at the City of Orange Natatorium. Fewer young people are enrolling for the courses although jobs are available. Red Cross lifeguard course members watch as Kylie Hale, 18, of Kirbyville (left) secures Eddie Dyess, 8, of Vidor to a backboard as instructor Berti Loken (right) assists at the City of Orange Natatorium. 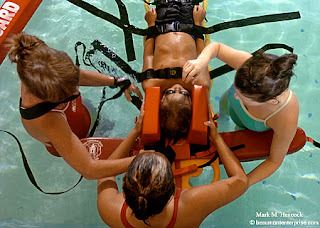 Red Cross lifeguard course members work on life-saving techniques at the City of Orange Natatorium. Although lifeguards earn about $7 per hour, it's not considered a "cool" summertime job anymore. 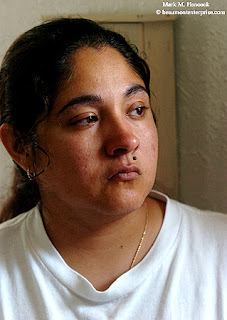 Please read "Swimming pools find it tough to fill vital jobs" by Emily Guevara. This is a compilation of photos and video from the Southeast Texas Wakeboard Classic in Rose City on Saturday, June 17, 2007. It's a one-minute-long test of some different features including a music loop. I expect to work with the video more and make something more compelling later. I uploaded a Quicktime (.mov) file, which looked really sharp. The Google compression turned it into something else. It isn't as bad as an .avi file, but it's nowhere near as nice as the original. Oh well, we're all in a learning curve. I thought it was hard to learn PhotoShop when it was introduced. Now, I'm trying to learn video, video editing software, SoundSlides, GarageBand and everything else these programs involve (music copyright, upload formats, etc.) - during deadline. Expect some crazy posts before the end of the summer. Gina Hinson of Nederland asks for more tea in front of "God's Colors," an oil on canvas by Colleen Burns, during lunch at the Art Museum of Southeast Texas in Beaumont on Friday, June 15, 2007. Beaumont residents Winnie Leviness (left) and Ann Bruno (right) have lunch at the Art Museum of Southeast Texas. Two Magnolias has moved its catering service to AMSET and serves lunch in the facility from 11 a.m. to 2 p.m. on weekdays. 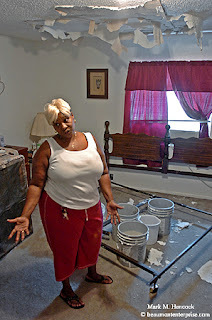 Velma Floyd explains the damage in her bedroom at Timberlake Court Apartments in Beaumont on Thursday, June 14, 2007. Contractors were making roof repairs when a storm hit Beaumont. 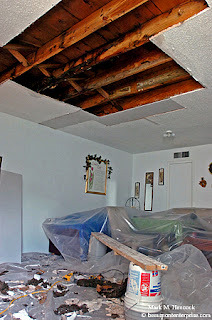 Although they tried to cover the roof, water leaked in and damaged several apartments. 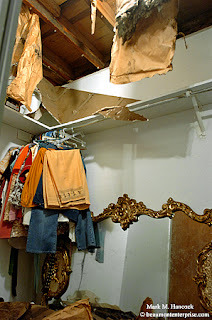 Items inside Velma Floyd's closet remain damaged at Timberlake Court Apartments. The flat-roof design of the apartments doesn't divert water as well as a gabled roof during storms. The living room of Velma Floyd's apartment remains damaged at Timberlake Court Apartments. The ceiling in Noemi Echavarria's apartment remains damaged as a roofing chute is visible outside her window at Timberlake Court Apartments. Lamar University student Noemi Echavarria has already changed apartments due to similar roof damage at Timberlake Court Apartments. 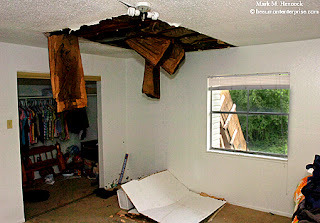 Please read "Apartment ceilings come down with rain" by Dee Dixon. 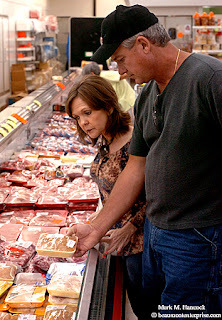 Billie and Robert Brown pass formerly favored foods to shop for healthy food at Woods Supermarket in Vidor on Saturday, June 9, 2007. Robert Brown had a heart attack earlier this year. 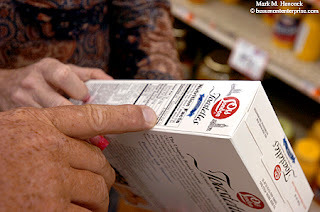 Billie and Robert Brown balance sodium and fat content of products at Woods Supermarket in Vidor. 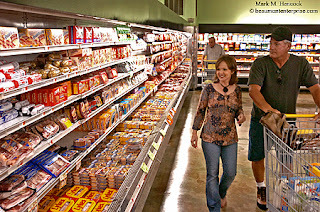 Billie and Robert Brown shop for healthy food at Woods Supermarket. After instruction and a shopping tour with a nutritionist, he is making healthier choices. After learning how to shop from a dietician, Robert Brown has shed 30 pounds while eating more nutricious food. Please read "Dieticians help people understand nutrition..." by Jane McBride. The Beaumont Enterprise, the leading daily paper and online news source in Southeast Texas, is seeking an experienced, creative, self-reliant and motivated employees to work in a team-oriented, content-rich environment for a paper with a tradition of public service. Application packages must be sent rapidly because these positions will be filled soon. These jobs are for experienced, competitive, detail-oriented professionals. A four-year degree is required for most positions. Five years or more experience at a daily paper is preferred. Beaumont is a Hearst metro newspaper. As such, it directly competes in-house against some of the top newspapers in the country. Additionally, it has good benefits and is privately held. 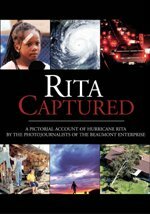 Last week it won 30 additional awards at the Southeast Texas Press Club annual competition. When applying for any job, mention you saw this opening on this blog (PhotoJournalism). Good luck. 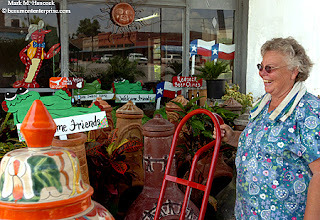 Sharon Fontenot, manager of B&B Imports & Pottery, laughs with a customer at the store in Sour Lake on Tuesday, June 12, 2007. Sour Lake is the birthplace of Texaco Oil. 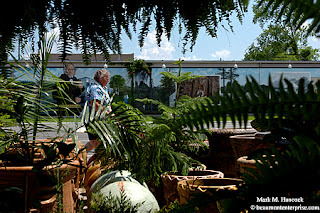 Sharon Fontenot, manager of B&B Imports & Pottery, organizes a new shipment of pottery at the store in Sour Lake. Sour Lake is working toward reviving an "Old Town" appearance. 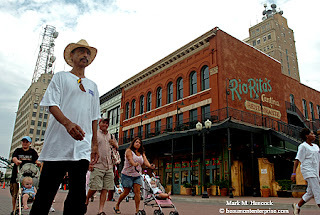 Many improvements have been made to the downtown area including murals and building improvements. According to Fontenot, the new city hall will incorporate architecture to complement the downtown area.